3.5mm jack AUX input. Enjoy your music wirelessly via Bluetooth or listen to your favorite stations with the digital FM tuner. Car Radio Bluetooth Multicolor. digital FM tuner. Bluetooth protocols:A2DP. 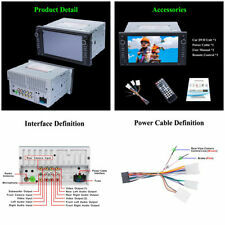 Interchange Part NumberDouble 2 Din Car Stereo. 7" HD Digital Touch Screen 2din In dash Auto Radio Universal Car Audio Video Player. Other Part NumberDouble 2 Din Car Stereo. ★ Car Video Audio MP3/MP5 Player. WILL FIT A LARGE VARIETY OF TOYOTA VEHICLES TOYOTA LAND CRUISER RAV4 PREVIA CELICA MR2 HILUX. 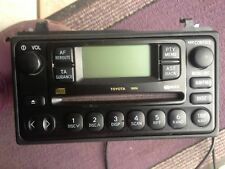 TOYOTA CD RADIO UNIT. YOU MAY NEED TO TAKE YOU FITTING BRACKETS OFF YOUR EXISTING UNIT TO GET THIS TO FIT. TOYOTAYARIS SINGLE CD RADIO PLAYER REMOVED FROM 2005 CAR IN FULL WORKING ORDER NO CODE NEEDED JUST PLUG IN AND PLAY YOU DO NOT GET THE DISPLAY IT IS ONLY TO SHOW THE UNIT WORKING. Radio Tuner: FM/AM. - Audio IC: YD7388 Top Global Cirrus IC, independent audio decoding. - Other: LRC synchronized display; ID3 search; Search by files; Album Picture; User-defined audio effect. - Radio response bandwidth: AM:522~1710 KHz, FM: 64~108 MHz. DVLA end of life vehicle centre. PLL Synthesized Electronic Tuning Stereo FM1/FM2/FM3 and High Sensitive AM1/AM2 tuner. Double 2 Din Car Stereo Reveiver DVD CD MP3 Player. 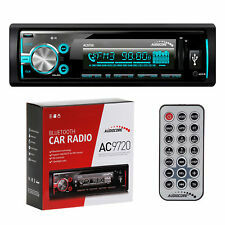 ※Car DVD CD Video Audio MP3 Player. High sensitive touch screen, easy to operate. 2009 - 20013 TOYOTA AVENSIS T27. TOYOTA AURIS CD RADIO MP3 PLAYER. CAR STEREO DECODED WONT ASK FIR A CODE WHEN FITTED. PLAYS MP3 CDS. SHOULD YOU REQUIRE A SECURITY CODE FOR THIS CD PLAYER ONE YOU HAVE I CAN CODE IT FOR YOU. FITS LATE 2006 AND 2007 2008 2009 AND EARLY 2010 MODELS. Toyota Aygo CD Player, CD/AUX radio stereo -. Fits Toyota Aygo: 2005 - 2014. This is a Toyota Aygo CD player which also includes a front AUX input, this AUX connection allows you to play many devices incl-. WILL FIT A LARGE VARIETY OF TOYOTA VEHICLES TOYOTA LAND CRUISER RAV4 PREVIA CELICA MR2 HILUX AVENSIS. TOYOTA CD CASSETTE TAPE RADIO PLAYER. YOU MAY NEED TO TAKE YOU FITTING BRACKETS OFF YOUR EXISTING UNIT TO GET THIS TO FIT. Toyota Alphard 2002-2006 original Radio CD Player. This is a Japanese Unit from a Toyota Alphard. Compatible FormatCD,DVD,MP3. Does the radio fit my car???. USB cable × 1. DVD host × 1. User\'s manual × 1. What\'s in the box Power cable × 1. We are in endeavor to provide you best service and keep you a happy buying experience from us. All their products are manufactured using high quality electronic components, assuring both reliability and excellent sound characteristics. Audiocore AC9600W. 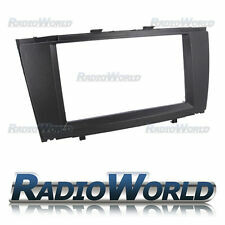 Robust design, beautiful design, ease of use and low price makes it the perfect radio for anyone passionate car audio. Unit Size2 DIN. Double 2 Din Car Stereo Reveiver DVD CD MP3 Player. Functions: ※Bluetooth Hands-free Function. ISO double din mounting size. About installation: Our car stereo has holes in both left and right sides, so to stabilize the car stereo you will just need the a few pieces of screws to lock. TOYOTA RAV4 CD RADIO STEREO PLAYER HEAD UNIT 00-05. Condition is vey good. Dispatched with Royal Mail 2nd Class. Genuine yaris cd player in perfect working condition. No coding required, straight plug-in and play. WILL FIT A LARGE VARIETY OF TOYOTA VEHICLES TOYOTA LAND CRUISER RAV4 PREVIA CELICA MR2 HILUX. DECODED WILL NOT REQUIRE A SECURITY CODE WHEN INSTALLED SIMPLY. TOYOTA CD RADIO PLAYER. YOU MAY WILL NEED TO TAKE YOUR FITTING BRACKETS OFF YOUR OLD STEREO AND FIT ONTO THIS STEREO. TOYOTA COROLLA VERSO CD RADIO PLAYER HEAD UNIT. PART NUMBER. MP5 Player. 1 x Car Stereo Audio MP5 Player. Built-in WIFI,support WIFI hotspot. Operation System: Android 8.0. CPU: Quad Core CPU Processor. Quad core. Compatibility: Special used for Toyota. Built-in radio function,FM/AM/RDS. Taken from Colour collection 2006 1.4 petrol. Replaced with double din Kenwood unit. Condition is Used but in very good condition. Taken from a 2011 Toyota RAV4. Toyota Auris: 2007 - 2009. Pioneer DEH-S100UB / MP3 / AUX / iPod / iPhone / Android Smartphone Player. Wiring harness to convert the factory plugs to allow the Pioneer to fit and play. iPod / iPhone Connection via AUX. Pioneer DEH-S100UB / MP3 / AUX / iPod / iPhone / Android Smartphone Player. Toyota Yaris: 2003 - 2006. Wiring harness to convert the factory plugs to allow the Pioneer to fit and play. iPod / iPhone Connection via AUX. FITS TOYOTA AYGO CITROEN C1 PEUGEOT 108. HAS DAB RADIO. COMPATIBLE WITH BLUETOOTH. COMPATIBLE WITH AUX AND USB. SHOULD YOU REQUIRE A SECURITY CODE FOR THIS CD PLAYER ONE YOU HAVE I CAN CODE IT FOR YOU. Toyota Rav 4, Cd Radio Fully Tested. Condition is Used. Pioneer DEH-S100UB / MP3 / AUX / iPod / iPhone / Android Smartphone Player. Wiring harness to convert the factory plugs to allow the Pioneer to fit and play. Toyota Corolla: 2002 - 2007. iPod / iPhone Connection via AUX. USB port, SD / MMC card up to 16GB. USB port, SD / MMC card up to 16GB, Bluetooth. USB port, SD / MMC card up to 16GB. 1 DIN radio. Removable panel with high resolution LCD display MP3/WMA. Equalizer - adjustable BAS/TRE/FAD/BAL. Toyota Avensis T25: 2003 onwards. Wiring harness to convert the factory plugs to allow the Pioneer to fit and play. Pioneer DEH-S100UB / MP3AUXiPodiPhoneAndroid Smartphone Player. iPodiPhone Connection via AUX. MODEL W13805 THIS NUMBER IS FOUND ON THE FRONT OF THE UNIT. TOYOTA AURIS CD MP3 RADIO PLAYER. PLAYS MP3 CDS. SUPPLIED DECODED WILL NOT ASK FOR A SECURITY CODE WHEN INSTALLED. IN FULLY WORKING ORDER UNIT HAS BEEN SERVICED. Taken from a prefacelift mr2 roadster but will fit other toyota models,good working condition when removed. MODEL W58816 IT FIT IF YOIU HAVE W58814 FITTED. SUPPLIED DECODED WILL NOT ASK FOR A SECURITY CODE WHEN INSTALLED. COMPATIBLE WITH CD CHANGER. TOYOTA COROLLA CD RADIO HEADUNIT. All stereo are tested thoroughly security marked internally and security labelled externally. MAY NEED CODING (Code not included). NO CODE INCLUDED WITH THIS UNIT. THIS UNIT HAS AUX AND USB PORTS. TOYOTA HI-LUX PICK UP ( 2010 - 2015 ). Here I have for sale is a used Toyota Corolla Stock Radio. There are no faults with this item and is working. Condition is you can see from the images. No refunds. TOYOTA YARIS CD RADIO BLUETOOTH AUX MP3 HEADUNIT. COMPATIBLE WITH AUX. HAS BLUETOOTH. PLAYS MP3 CDS. All stereo are tested thoroughly security marked internally and security labelled externally. THESE CAN EASILY BE TAKEN OF YOUR EXISTING UNIT THEY PULL OF AND PUSH BACK ON. PLL Synthesized Electronic Tuning Stereo FM1/FM2/FM3 and High Sensitive AM1/AM2 tuner. ※Bluetooth Hands-free Function. ※FM/AM Aux-in USB SD Card Slot. Built-in bluetooth, You can use this function to connect to a phone songs or dial the phone. TOYOTA AVENSIS T25 HEAD UNIT RADIO CD STEREO PLAYER. Removed from 2007 AVENSIS. PART NUMBER. MAY NEED CODING (Code not included).